Such an easy, healthy and nutritious meal! Simple seasonings mix with lean ground turkey and farro for your new favorite dinner - and all for under 350 calories! 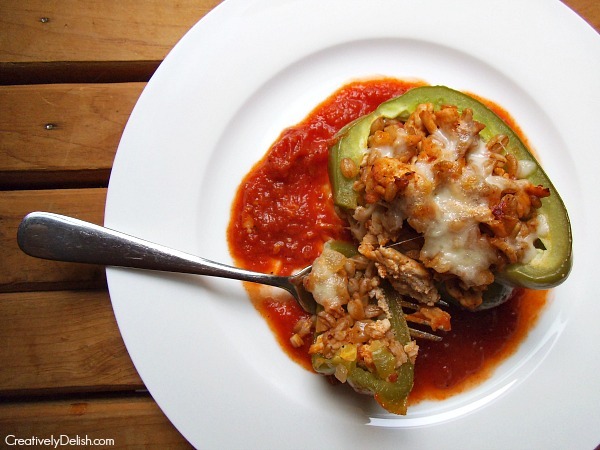 Marinara and fresh shredded mozzarella cheese are added in for a savory, italian-style kick while the farro gave a perfectly chewy texture and a great boost of whole grain nutrition to the dish. I chose green bell peppers for a few reasons. One, they were on sale for $0.99 each. Two, they have a little more flavor than other peppers. Three, they hold up well when cut in half and stuffed with lots of goodies. I decided to use farro not only because I absolutely love it but also because I had a handy dandy bag of 10-minute farro in the cupboard and I was running against time on this recipe (it was a busy day). Which proves just how easy this is to throw together! The prep work is a bit time consuming, but once I covered it and threw it in the oven, I had 30 minutes to shower, throw a load of laundry in AND feed the cat. Besides, the prep work is supposed to be fun because your supposed to taste test every step of the way (just wait until the turkey is cooked please). I only baked them for 30 minutes at 400 so that the peppers still had a little snap to them. 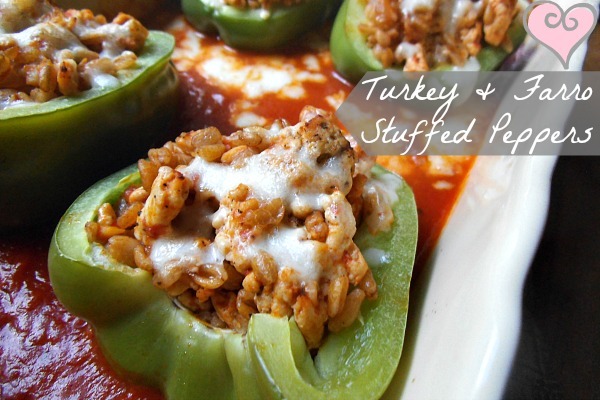 No one wants a mushy pepper, so be careful not to overcook them! After the 30 minutes was over, I took the cover off and broiled on low for 2 minutes to let the cheese bubble up a bit. And thank goodness for leftovers! These were so delicious re-heated in the microwave! You could even freeze them too for a busy day's dinner. 2 large green peppers, cleaned then cut in half lengthwise. Remove all the insides. Preheat the oven to 400 and set aside a deep baking dish with about a ½ cup marinara poured over the bottom. In a large pan, cook the turkey until it's no longer pink, then add the olive oil, garlic, onion and about 1 tsp of each salt, pepper and red pepper flakes. Cook for about 5 minutes, stirring occasionally. 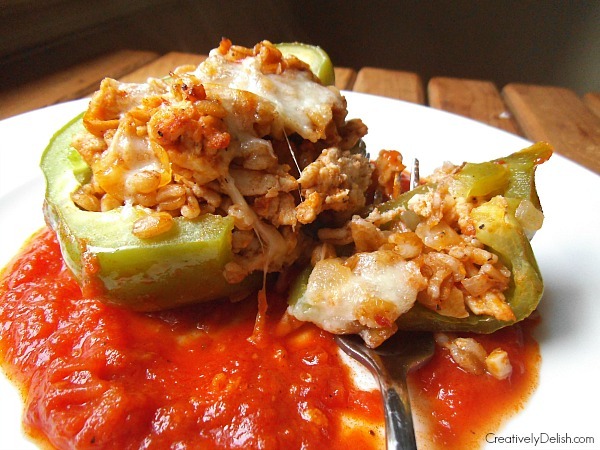 Stir in ½ cup of marinara and ¼ cup shredded mozzarella cheese and let it sit over low heat for 5 minutes, then add in the farro and stir again. Using a spoon, spoon some mixture in to each pepper, then place the peppers in the baking dish. 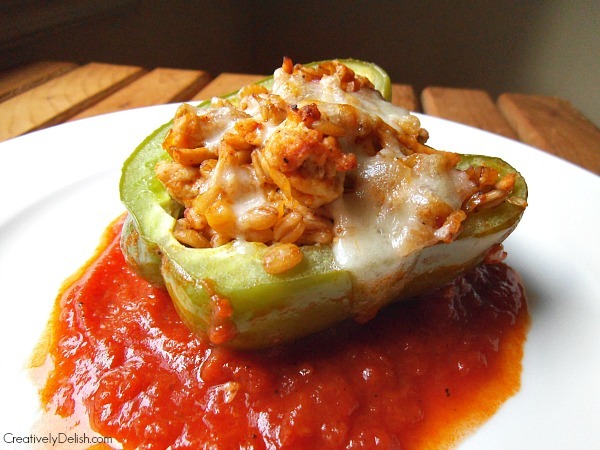 Sprinkle the remaining cheese over the peppers, then cover with tin foil and bake for 30 minutes. Remove the foil and broil on low for 2 minutes to let the cheese bubble up, then let it sit to cool for 10 minutes before serving.